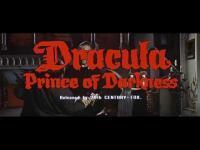 Dracula: Prince of Darkness (1966) is a British horror movie from Hammer Films that was wonderfully executed by director Terence Fisher (Horror of Dracula (1958), The Curse of Frankenstein (1957), The Mummy (1959)). I encourage vampire, Dracula and horror fans to at least watch this movie once to have an idea how well movies were made in the 1960’s without all of the technology we have today, a true classic horror movie. Great special effects without CGI and other enhanced equipment. The film is filled with suspense, thrills, frightening moments, tension and does not contain gore or violence. There was only one scene that a lot of blood, but it was not a gut-wrenching scene that weak stomach viewers will get sick upon viewing. Dracula: Prince of Darkness starts by having someone narrated by voice over the final scenes from Dracula showing Van Helsing (Peter Cushing) leading Dracula (Christopher Lee ) into the sunlight and destroying him. The narrator mentions that Dracula’s reign of terror and cult is only a memory now. The movie takes place ten years later showing Father Sandor (Andrew Keir - Rob Roy (1995), Adam Smith (1972), Cleopatra (1963), Five Million Years to Earth (1967)) thinking a female corpse might be a vampire. Sandor warns the Kents (four English tourists) not to visit Karlsbad, and they did not listen to him. The Kents found themselves abandoned by their coach driver within view of the castle in Karlsbad. The carriage/coach had no driver but was able to drive itself to the castle where the table was set for four people. After a few events that I will not spoil, Dracula is revived and now alive. Two of the Kents, Charles (Francis Matthews - Paul Temple (1969), Captain Scarlet and the Mysterons (1967), The Revenge of Frankenstein (1958)) and Diana cannot find Alan and Helen. After a few more events, Charles and Diana discover that her crucifix can be used as a weapon on Dracula and Helen. Diana (Suzan Farmer - Monster of Terror (1965), Rasputin: The Mad Monk (1966), Persecution (1974)) and Charles manages to escape and receives help from Sandor. Dracula (Christopher Lee - The Lord of the Rings: The Fellowship of the Ring (2001), Star Wars: Episode II - Attack of the Clones (2002), The Lord of the Rings: The Two Towers (2002), Star Wars: Episode III - Revenge of the Sith (2005)) wants Diana for himself and will not let anyone harm her. The movie was captivating, and I love it. The actors did a phenomenal job with their parts especially Christopher Lee. This film is one of the best movies in its Dracula series, and it is all thanks to Christopher Lee. The special effects team did an amazing job with the sound, lighting, and special effects. The makeup crew did an astonishing job with the realistic makeup job they did. The cinematographer, set, screenplay writer and the whole entire team for this movie pulled off a wonderful job. I gave this movie an eight because it is a classic horror film and a movie that I see once in awhile and do not get tired. Avg. Rating: 3.79/5 stars from 7,764 users.